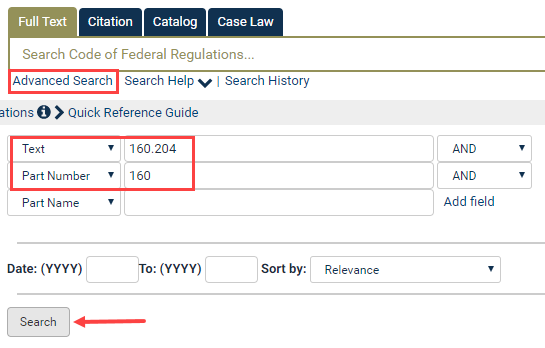 The Code of Federal Regulations in HeinOnline is only indexed down to the part level. Since a section number can appear in multiple volumes or editions, it is best to narrow your search using a date range and include the part number in the search query. Begin by using the Advanced Search option a the top of the main page. From here use the Text and Part Number option from the drop down menu. You can also search using the Full Text tab at the top of the main page. From here you would type text:160.204 AND part:160 and hit the search button. I see a citation to another work (such as the Federal Register, Statutes at Large or CFR), how can I view the cited material? How do I search by CFR citation? How do I search for a section in the CFR? How do I use the title/part/section quick locator tool in the CFR? How do I refine my search and build a multi-term search query in the CFR?